Whether we were brought up in a strict home or a lenient home, we all have a conscience. And there’s nothing we can do about the stain of sin upon our conscience. Time will never obliterate our sin. We need God to do that for us. The story of David is well-known; he committed adultery with Bathsheba. She became pregnant, and then he had her husband, Uriah, killed. For a while, David thought his sin was covered, that he had done what he needed to do to get out of the mess and salvage his reputation. But the cover-up didn’t work very well. It never does. 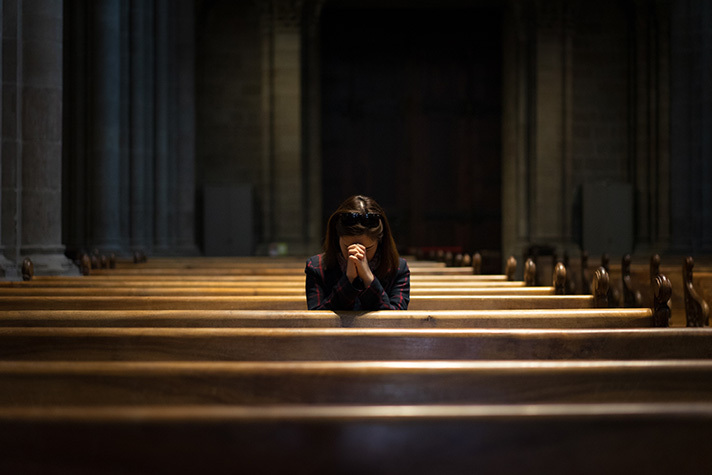 Psalm 51 is David’s prayer of confession before God as he spills out his heart, and Psalm 32 is the psalm that David also prayed, most probably in connection with Bathsheba, as he thanked God for His forgiveness. It shows a wonderful contrast between the burden of guilt and the blessing of forgiveness. Psalm 32 reveals David’s experience in three stages. The first stage is the burden of unforgiven sin, the burden under which David lived when he tried to cover his sin. What was that like? Some scholars think that David was in this state of cover-up for nearly a year before he came clean with God. You’ll notice that this psalm begins by saying, “Blessed is the one whose transgression is forgiven, whose sin is covered. Blessed is the man against whom the Lord counts no iniquity, and in whose spirit there is no deceit” (Psalm 32:1-2). And now comes the description of life with unforgiven sin. “When I kept silent, my bones wasted away through my groaning all day long. For day and night your hand was heavy upon me; my strength was dried up as by the heat of summer” (Psalm 32:3-4). Eighty percent of our emotional energy is usually spent trying to cope with self-condemnation and the sense of guilt that many of us have experienced. As a matter of fact, guilt tends to break down the immune system, making a person more susceptible to disease. And unresolved guilt affects behavior. If you don’t overcome guilt, you will have a tendency to addictions. You’ll have a tendency to repeated compulsive and destructive behavior because you are trying to somehow resolve the tension of who you know you should be and who you know you are. When my wife and I were in England, we went to John Bunyan’s grave. He was the man who wrote “The Pilgrim’s Progress,” in which he talked about Pilgrim walking with this heavy weight on his back. And on Bunyan’s tombstone is a carving of a man walking with a weight on his back that was too heavy for him to carry. That’s the way it was for David when he was in the mode of cover-up, minimizing his sin and refusing to ask God’s intervention and forgiveness. That’s stage 1. Stage 2 is the agony of confession. Confession is not easy. David says, “I acknowledged my sin to you, and I did not cover my iniquity; I said, ‘I will confess my transgressions to the Lord,’ and you forgave the iniquity of my sin” (Psalm 32:5). In other words, “I stopped living a lie. I stopped hiding. I exposed my soul with its sin to God.” So now David has come clean. Why is confession so difficult? It’s because there are alternatives to confession. We dodge repentance through rationalization. “Everybody does it,” we tell ourselves. We minimize our sin and magnify the sins of others: “Well, I’m not as bad as So-and-So.” Or we think that somehow we must pay for our sins. But the one thing that is most difficult is to simply be honest with God and say, “All the closets of my life are now open to You. Everything is exposed. Nothing is hidden from Your sight. You know it’s there, and now I am acknowledging it is there, too.” The agony of confession! Notice how David describes it: “Blessed is the one whose transgression is forgiven, whose sin is covered” (Psalm 32:1). God took the ugly mess and He sent a snowfall to cover the ugly trails and all of the ruts in the road of my life, and He no longer holds us guilty as a result of it. Oh yes, consequences may continue, as David experienced, but the guilt is gone. There is now freedom. It is as if David is saying, “When I was out of fellowship with God, I had no sense of God’s guidance. But He forgives me, He hides me, He guides me, He inspires me.” And he says in Verse 11: “Be glad in the Lord, and rejoice, O righteous, and shout for joy, all you upright in heart!” You give praise to God because of the freedom and because of the conscience that has been cleansed. Adapted from a sermon preached Aug. 21, 2005. Used by permission of Moody Church Media. Erwin W. Lutzer is pastor emeritus of The Moody Church in Chicago, Ill., where he served as the senior pastor for 36 years. He is also a radio speaker and award-winning author.